South Korea’s western port city of Incheon ranked first in gross regional domestic product (GRDP) in 2017 among the nation’s six metropolitan cities after beating Busan for the first time since record-keeping began in 2003. 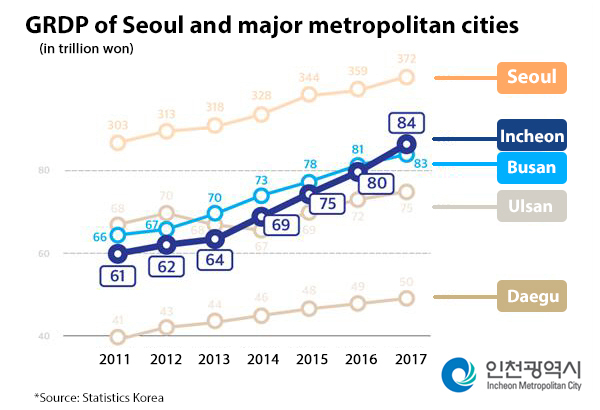 According to data released by Statistics Korea, Incheon’s per capita GRDP, or output divided by the regional population, reached the highest among six metropolitan cities at 84.1 trillion won ($74.8 billion), followed by Busan at 83.8 trillion won, Ulsan 75.1 trillion won, Daegu 50.8 trillion won, Daejeon 37.3 trillion won and Gwangju 35.4 trillion won. 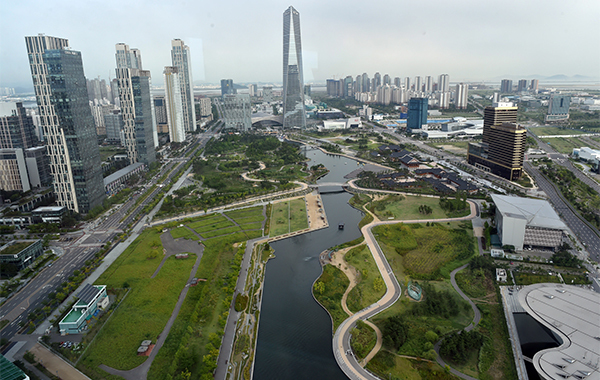 Incheon topped the list as the most prosperous regional city thanks to its rising population. The local population rose from 2.58 million in 2002 to 2.95 million in 2017 while that of southern port city of Busan fell from 3.73 million to 3.47 million over the same period. The population gap between the two cities also narrowed from around 1 million to 500,000. Incheon located 40 kilometers west from Seoul has kept attracting new residents on surging real estate prices and development of free economic zones. The total population of Incheon including foreign residents exceeded 3 million in 2016. The city government said that sound economic indicators of the city also drove up its per capita output. Incheon ranked top with an economic growth rate of 4.0 percent and an employment rate of 63.3 percent among seven major cities including Seoul in 2017. Of the 17 cities and provinces across the nation, Incheon came in second in foreign direct investment with $4.8 billion, just behind Seoul with $7.2 billion.